Comes With Wheels Easy To Pull Along. > Great Sound Volume And Clarity ; 2 10 inch woofers and tweeter horns with flashing LED feature! > Many Functions And Features ; bluetooth, controls mic volume, music volume, echo, etc. , USB/SD/MMC port, master equalizer, and so much more. > Extreme Portability And Wireless , ONLY 6213 AND 6212 trolley handle and ALL 3 MODEL COMES WITH wheels lets you carry the system easily, and can battery charge for better convenience. All models Shier Sound is a wireless sound system, boasting 210'' strong woofers and quality tweeter horns, an absolute must for party occasions. The wooden & ABS plastic material offers great durability and protection for the system, important when storing it in the back of your vehicle on long rides or for minor bumps when carrying. For night events, you can have the sound system light up with flashing LEDs; the center of attention will be always be on the singer and will create a great party atmosphere! What's more, the complete package is versatile and easy to transport thanks to the molded handle as well as a retractable trolley handle for easy carrying. Not only that but it is fitted with wheels for extra portability. While the hardware is certainly impressive, the functions are too. Controls include MIC Volume, Music Volume, Echo, Bass, Treble, so lots of ways to tune your music how you want it. Bluetooth function, LED display screen, with USB port and SD/MMC card player, and many more! Get yourself one today and be the life of the party! Voltage AC85V-265V is suitable for various countries, any changes can be available if you have any special requirements. Built in 12V/7A rechargeable battery inside, it can be used for 4 to 8 hours depend on high or low volume with no external power for indoor or outdoor use. 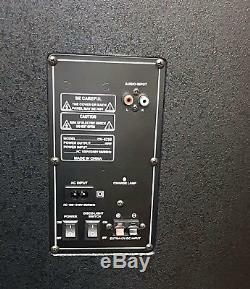 Built-in high quality class D amplifier. Bluetooth function, multi changing Led lights. With USB port and SD/MMC card player. 5 Bands EQ separately control. AUX input can be connected to a computer or MP3 player or other sound source. With two VHF wireless microphones. With two wired microphone input jacks. Microphone priority function, when you speak through microphone, the music volume will automatically be lower. Control includes MIC Volume, Music Volume, Echo, Bass, Treble. With higher/ lower voltage protection. 100% brand new with great quality. Bluetooth 4.0 technology for lower energy consumption but more stable connection and faster transmits speed, effective wireless operating distance is up to 10m. Noise cancellation function wireless capacitive microphone, you can enjoy singing wonderful music by yourself. Bluetooth wireless design for connecting to any Bluetooth enabled smart devices. With the APP, you can experience the effects KTV karaoke rooms and functions. Multipurpose:Bluetooth speaker, Karaoke singing, Car Stereo, instrument recording, interviews, podcasting, etc. Bluetooth Version :Bluetooth 4.0. Working time: more than 8 hours. 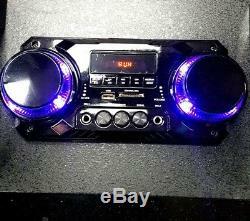 The item "39 Bluetooth Loud DJ Party Disco Speaker With Karaoke USB SD RGB LED AUX RADIO" is in sale since Monday, November 5, 2018. 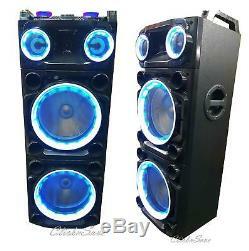 This item is in the category "Sound & Vision\Portable Audio & Headphones\Portable Stereos & Boomboxes". The seller is "rsadeals" and is located in Greater Manchester. This item can be shipped to United Kingdom, Austria, Belgium, Bulgaria, Croatia, Cyprus, Czech republic, Denmark, Estonia, Finland, France, Germany, Greece, Hungary, Ireland, Italy, Latvia, Lithuania, Luxembourg, Malta, Netherlands, Poland, Portugal, Romania, Slovakia, Slovenia, Spain, Sweden, Australia, United States, Canada, Brazil, Japan, New Zealand, China, Israel, Norway, Indonesia, Switzerland, Chile.